This smart little box gives you a lot of content for your money, but beware of all those passes bringing up the cost. Although smart TVs are becoming increasingly popular among consumers, not everyone has jumped on the bandwagon. But, if you haven't upgraded your dumb TV, why not try a streaming box, like the Now TV Smart Box with 4K HD and voice search? The great thing about streaming boxes is that you can get your hands on most of the great content a smart TV provides without the steep cost - and the new 4K HDR and voice search-enabled Smart Box from Now TV does just that. With the announcement that Now TV is rolling out a Netflix app across its devices, it's easier than ever to jump between Now TV Entertainment Pass shows like The Walking Dead and Netflix Originals like Bojack Horseman without the hassle of switching cables. You can buy the Now TV Smart Box with 4K and Voice Search from the Now TV website for £45.99, which is at the lower end of the price range for this kind of product - although you can get the Amazon Fire TV Stick with 4K for £49.99 from November 14. You will also need to purchase a pass to watch Now TV content - ranging from £3.99 to over £30 per month. You can buy Entertainment, Sky Cinema, Kids, Sky Sports, and Hayu passes depending on what kind of content you want to watch, which does bump up the price. However, it is possible to purchase a bundle with your Now TV smart box, which costs £49.99 - along with the device itself. This gets you one month of Entertainment, Sky Cinema, and Kids, plus a Sky Sports Day Pass, which we feel is pretty good value for money. We'd definitely recommend opting for the bundle if you haven't used Now TV before, as it also allows you try out the different services before committing to the additional monthly spend. The Now TV smart box is designed to fit unobtrusively into your home - it's small and light enough to hold in one hand, with a glossy black finish, and rounded corners. 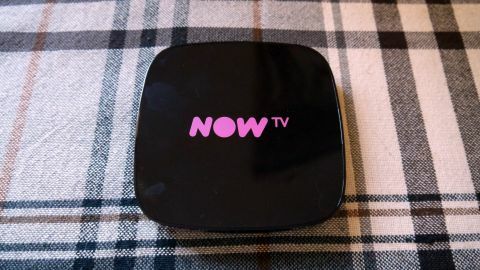 On the top of the box is the Now TV logo in hot pink, which may not appeal to everyone; if you prefer a 'quieter' colour scheme, you may want to try Amazon Fire TV or Apple TV instead. Still, the device itself is so compact we doubt most people would find the look of the smart box to be particularly offensive. On the back of the smart box you can find a HDMI port to connect to your TV, an Ethernet port should you prefer not to use your WiFi connection, and a DC connection to plug the box into the mains. There's also additional microSD storage so you can save additional apps that don't fit in the box's inbuilt memory. When you unpack the Now TV smart box you'll also find a remote control, which uses AA batteries (these are included, which is always a good thing). For ease of use, the remote control has a few dedicated buttons for different parts of the interface, including 'My TV', 'TV Guide', 'Kids', and the 'Sky Store', as well as a 'microphone' button to enable voice searching. One convenient feature of the remote is that, once paired, it can control your TV's volume, meaning you won't be constantly switching between different remotes - although it's worth noting that it can't be used to control external sound devices like sound bars. Setting up the Now TV smart box is really simple - once you've plugged it into the mains and connected it to the HDMI port on your TV you'll be prompted to pair the remote control. Once you've done this you can set up the Wi-Fi connection - this is often the most irritating part of setting up an Wi-Fi device, but as the interface is so responsive to the remote control, it takes no time at all to select your network and type in the password. You can also connect to the internet using an Ethernet cable if you prefer. If your connection has been successful, a short code will appear on your TV screen which you will need to type in to a dedicated page on the Now TV website, and the sign in to your Now TV account. If you don't have one, we'd recommend doing this before setting up your smart box, as it can take a few minutes to put in your account and payment details. Now that you've signed in, you should be ready to go. You'll be able to use catch-up services like BBC iPlayer and ITV player straight away, as well as apps that you have accounts with like YouTube and Netflix, which is a brand new feature for this model. Unfortunately, it still doesn't include Amazon Prime, so you'll have to watch exclusive shows like Jack Ryan elsewhere. To get access to Now TV services you will need to pay for the relevant pass - the Entertainment pass for example gets you access to live TV from the likes of Sky One, National Geographic, and Comedy Central, as well as the ability to watch box-sets like The Walking Dead. Although a huge selling point of the new smart box is that it supports 4K content, all of the Sky-based content is relegated to 720p resolution, which isn't great if you're expecting to be able to watch Sky Cinema in glorious full HD. Still, Now TV has promised that Sky content will be upgraded to 4K by the end of the year, so this issue could well be resolved very soon. One big downside to the smart box is that, unlike previous models, there is no antenna connection, meaning you won't be able to use it to watch Freeview channels - however, you can still watch non-Freeview live content, with the ability to pause and rewind. All of the passes include a mixture of live TV and streamable content, which does give you a lot of choice - although we would have liked a larger variety of TV channels in the Entertainment pass in particular. We really liked how the user interface was set out - it felt intuitive and extremely easy to use, with the home page displaying 'must see' shows, a 'continue watching' section so you can go straight to the content you were watching previously, and a list of all your apps. Another way that Now TV has made navigating the interface easier is by enabling voice search - to use this feature, just hold down the microphone button on the remote control and make your request. We were really impressed by the speed that the smart box responded to our queries, and it was often easier than scrolling through the various areas of the interface to find what we wanted. Annoyingly, voice search doesn't work with the YouTube app so you'll have to rely on using the remote to type in your search queries on the onscreen keyboard. Overall, we are pretty impressed with the Now TV smart box, and we feel that it represents great value for money - watch out for all those content passes however, as we can see the monthly cost quite easily stacking up. One way around this is to purchase the bundled version of the smart box and try out the different passes before committing to a larger monthly spend - that way you'll know which content you can and can't live without. The priciest pass is the Sky Sports Monthly Pass, which comes in at an eye-watering £33.99 per month - if you're a casual viewer or just want to watch one important football match as a one off, it might be worth buying a day pass for £7.99 on occasion. Even if you only buy one or two monthly passes, you get an awful lot of content for your money - although it's a shame that this latest model doesn't support Freeview, meaning you'll have to switch between inputs on your TV for terrestrial channels. The main selling point of the smart box is that it supports 4K content and voice search - both work really well, but aren't supported by every app, so it's worth being aware of that if you were looking forward to watching Sky Cinema in Full HD. In terms of usability, Now TV has made it really simple to use the streaming device, with intuitive menus, fast response times, and easy-to-navigate layouts, making it a great choice for even the most technologically challenged among us. Compared to competitors like Apple TV and Amazon Fire TV, the Now TV Smart Box has a clear advantage in terms of price, and now that it supports Netflix, there's a wealth of content to choose from - although it doesn't support Dolby Vision or Atmos. Still, it does support 7:1 and 5:1 surround sound pass through - but keep in mind that this doesn't necessarily mean that all the content automatically comes in surround sound and you may need to plug in a different device for this to work.